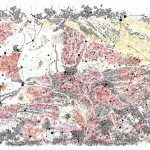 Let us call Dana Velan’s new drawings maps, and see where that word leads us. 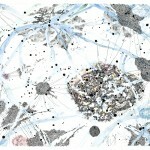 There is, after all, motion implicit in the fabric of all maps. Put any of us in front of one, and you can soon recognize a traveller. Someone who is somewhere, and wonders about elsewhere. This traveller might be really pining to get to there, or merely a daydreamer of place names. Either way, he is intent on that 1:1 moment of correspondence, where mind and map, consciousness and representation, lock into perspective. Whether or not the traveller is going anywhere, a map is a landscape unfolding in stilled time, providing a canvas for his movement. It’s only the scale of his motivation that differs, and the inwards or outwards direction of his motion. Gazes and fingers are effortlessly sent afloat over a map, and the imagination soon follows. 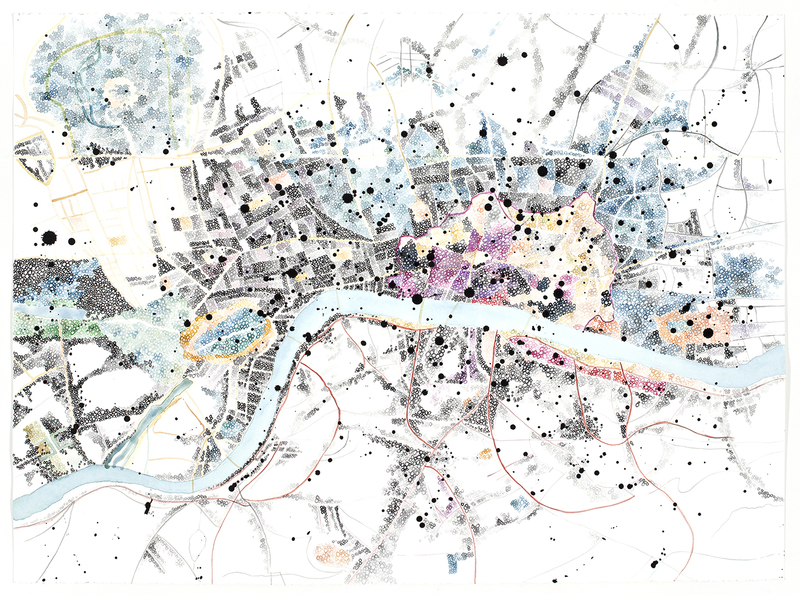 Dana Velan’s maps, freed of their instrumental bonds to the realities of space and place, accentuate this drift coefficient. They are devoid of the twin tools of scale and legend. The scale gives rhythm and measure to the map, exposing its relationship to the things, large and small, it attempts to depict. The legend defines the colourful stand-ins for the features of real things. The common metaphors of a roadmap immediately come to mind: major and minor roads, towns and cities, forests and parks, river runs, lake sides, mountain ranges, the occasional landmark… The legend provides definitions of the symbols and colours whose patterning and repetition help us make sense of the illustrated expanse. 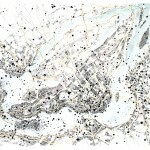 Once the scale and legend have been defined, we can throw a skein of words and numbers over the map, the nomenclature of places and distances that further ties the image of the map to an external reality. Scale and legend are bound to the dimensions of a given depiction: those things which the map attempts to story. In the case of the drawings at hand, the road map is far from the most fitting, or the only possible, metaphor. Why not leave it behind and abandon ourselves to the pull of abstraction? 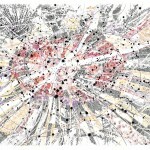 We can consider maps, in more generic terms, as visualizations of a given system existing in space and time. 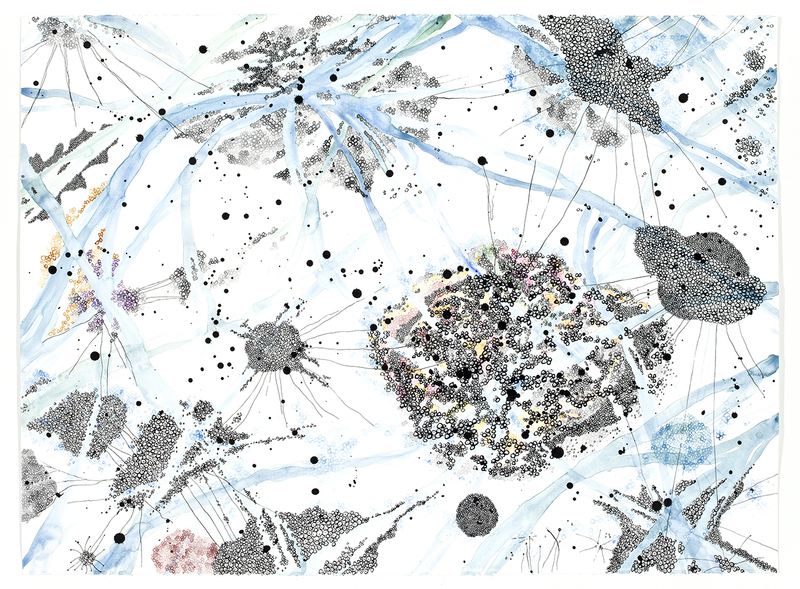 Subatomic, biologic, geographic, historic, cosmic… All those storied adjectives, and a myriad more, can be drawn through the feedback loop of the map, as it tries to enlighten us, through an encompassing visual confection, as to the dimensions of a reality at hand, a thing in mind. 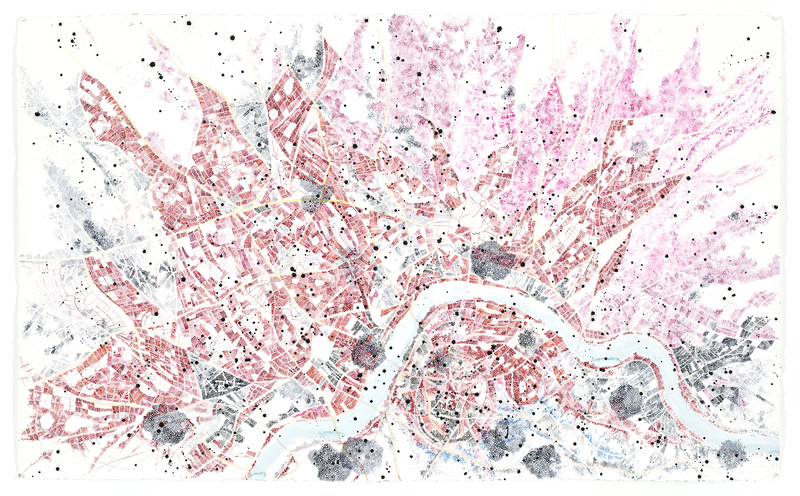 Dana Velan’s drawings reassert the fact that, before and after they are instruments of knowledge, maps remain images. 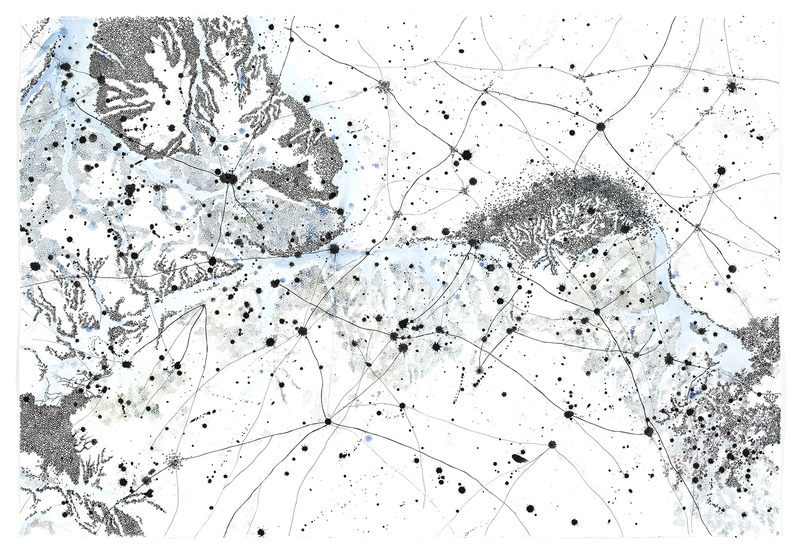 Her mappings remind us that, if we remove the names and numbers, the coordinate systems and taxonomies that litter the surface of a map, we are left only with a silent weave of signs… Her drawings unmap the map, bringing it back to the basic idea of itself, stopping its explanatory and expository tendencies, and letting it speak in its own name. Here, “blue” does not necessarily mean “water”, “red” “blood” or “dot” “town”. Colours and signs escape codification, and things are both larger and smaller than they appear. Scaleless and legendless, her maps picture phenomena happening at unknown scales, waiting for their legend and nomenclature to be renewed. Let us stop for a moment and consider the handmade dimension of her work. Maps tend to be precise graphical instruments, compass drawn and machine made. Here they have the approximate beauty of hand drawn things. They very loosely pretend to reality. What do these maps show? 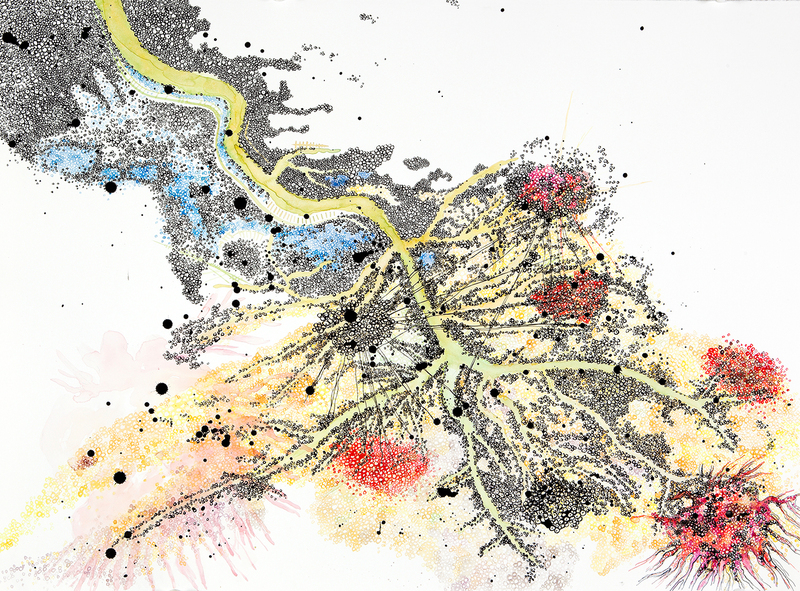 The graphical imprecision of Dana Velan’s drawings embraces the geography of her gestures. 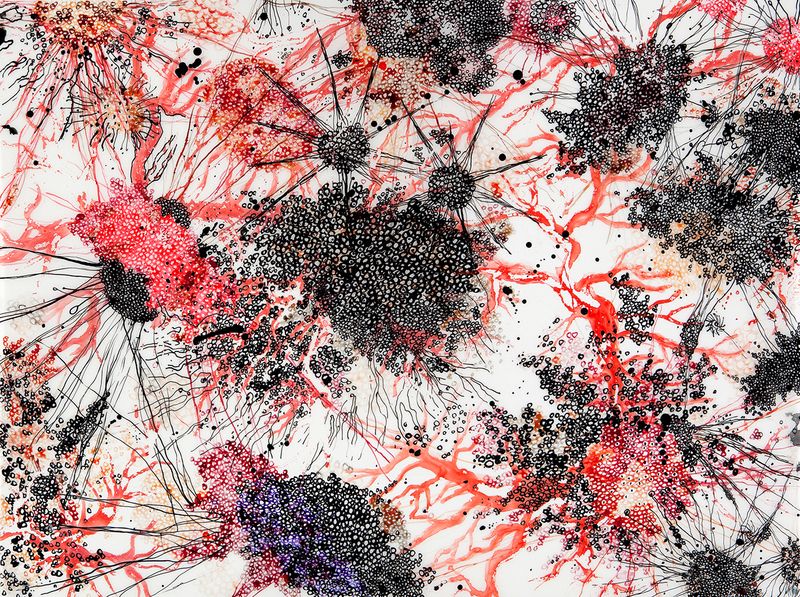 Flows and clusters spread inkily, wavering lines and tendrils shoot out, squiggly dots proliferate and congregate, in an organic ballet of an unknown nature. 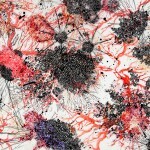 Fibrillated lines, cellular dots and watery stains. A palette of sanguine to rosaceous reds, bluish washes, yellow greens, inky blacks and watery greys. Things mysteriously contracting and expanding in the null-space of white paper. 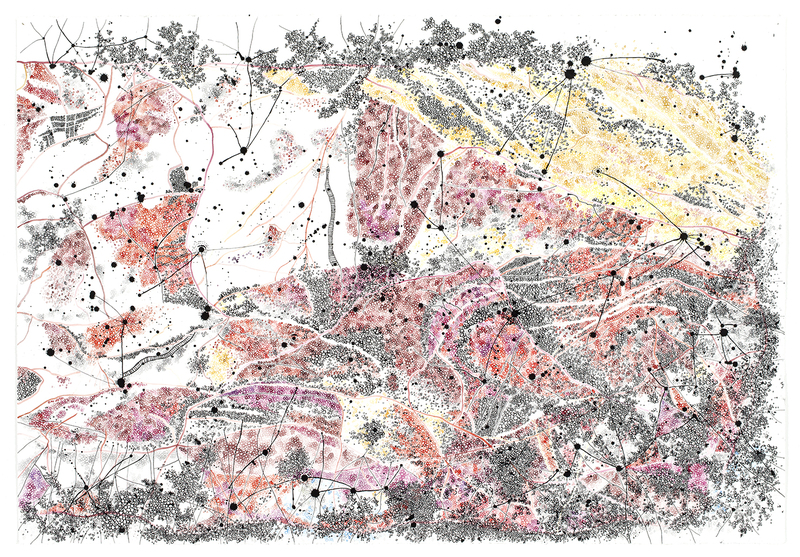 Depicting adimensional phenomena, dispatches from outside the visible spectrum, of things normally occurring at speeds and scales alien to our everyday gazes, these maps material meditations on the act of mapping. These material considerations circuitously bring us back to the question of scale. There is an actual scale and an apparent scale to her drawings. 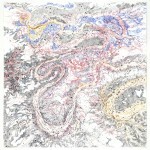 Factually speaking, she draws small maps on 5” x 7” paper, and large ones on sheets of 22” x 30”. That being said, on the 4” x 6” photographic reproductions on which I consider them, these formats appear equal. I have to annotate their reverse to remember how small or large they are in the studio. There is another, more pertinent way to consider their scale, having to do with the shifting equality of their perspective. 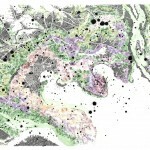 As maps are wont to, most of the drawings give the impression of a view from above. We are suspended before or above these maps, in the outer space at their threshold. The blankness of the paper background suggests the infinite in all directions. This view from above will not save us from our questions. Are the forces at play centripetal or centrifugal? Up or down there, are things floating apart or coming together? Are these masses growing or shrinking? Are we falling toward the landscape? Is it coming at us with meteoritic intent? Or are we simply leaning towards the macromicroscosmos, like scientists intent on their eyepieces? No matter, we are left with an encompassing sensation, conjugating the motion of objects within the canvas with the implied motion of our own point of view. This sustained illusion of mobility conjures the appearance of life. 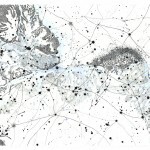 The relationship of these maps to lived phenomena is unclear, but this very imprecision sustains the idea of a kinship between the maps and the hidden forces of life. Flipping through the photographs of the drawings calls to mind the geometrical fall outwards and inwards of Powers of Ten (1977). In this Charles and Ray Eames short, each scene pulls us a power of ten away from a sleeping picnicker on a lawn in Chicago, up to the outer recesses of the cosmos. We then fall back earthward, rejoining our stilled traveller and plunging by equal increments into his organism, down to its electromagnetic core. The carpet is pulled, again and again, from under our feet. 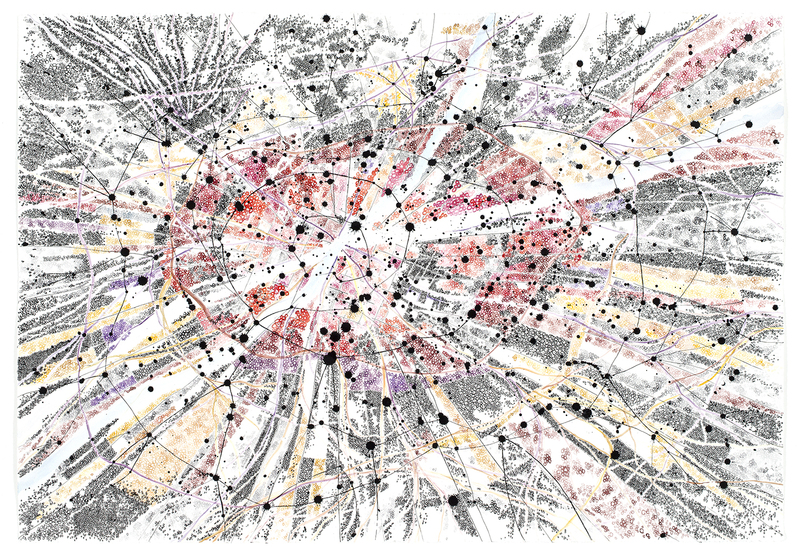 Like the Eames classic, Dana Velan’s maps mirror some of our disbelief and wonder at the relationship entertained by certain scientific visualizations to our own lives. Except if we are aficionados of the psychotropic or fathom-deep meditation, most of us have equal difficulty relating the coloured fantasmagoria inside a particle accelerator, the agitation of microorganisms within a bacillus or the cosmic perspectives of long range telescopy to the realities of our earthly existence. These words don’t quite fit the picture. 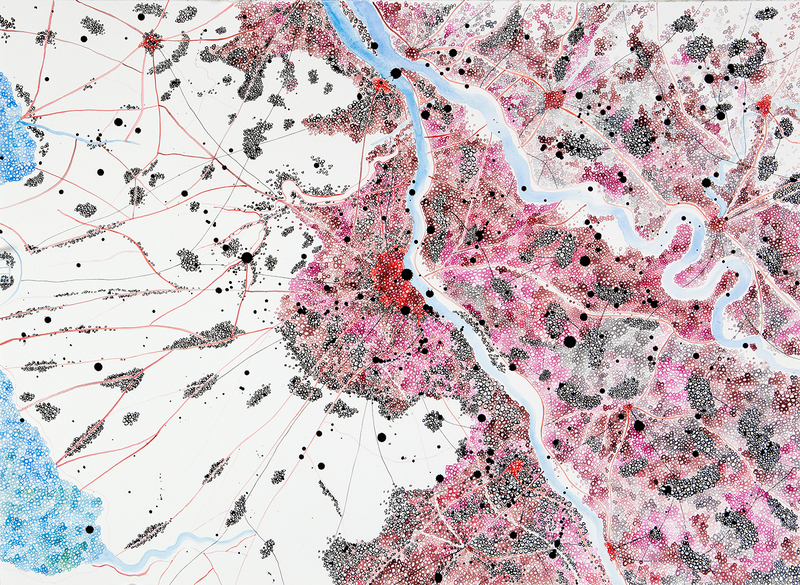 Could we say instead that what Dana Velan’s maps embody are not visualizations but visions, induced through gesture? Like the instrumental purviews of science, her drawings proceed through a conjunction of eye and mind, but their instrument is also the hand, and, always, also, the matter at hand. That being said, the term vision, is of course loaded with most unwelcome associations. Its, quite unscientific, mystical overtones do not quite do justice to the nature of the drawings; they are visions only insofar as they defy the boundaries of appearance. Of the processes of life, only a minute portion appears to our senses. There is a host of inaccessible events within and without us, and any picture of ourselves and of our place in the universe is necessarily incomplete. We seek amplificatory apparatus, scientific, psychedelic, mystical, to make sense of things. In order to acknowledge our heartfelt mystery, we often revert to languages burdened with images that ignore their own natures: esoteric tongues which translate only, for the uninitiated, into vague realities, constrained to evocation. Although we might master the methods of transcendence, harness the rains of hallucination, or control the procedural languages of science and mathematics, in the end, turning upon ourselves, we acknowledge that half understanding which is our natural lot. And so we must again and again turn to ourselves. That is where the gestures of art slip into the equation. 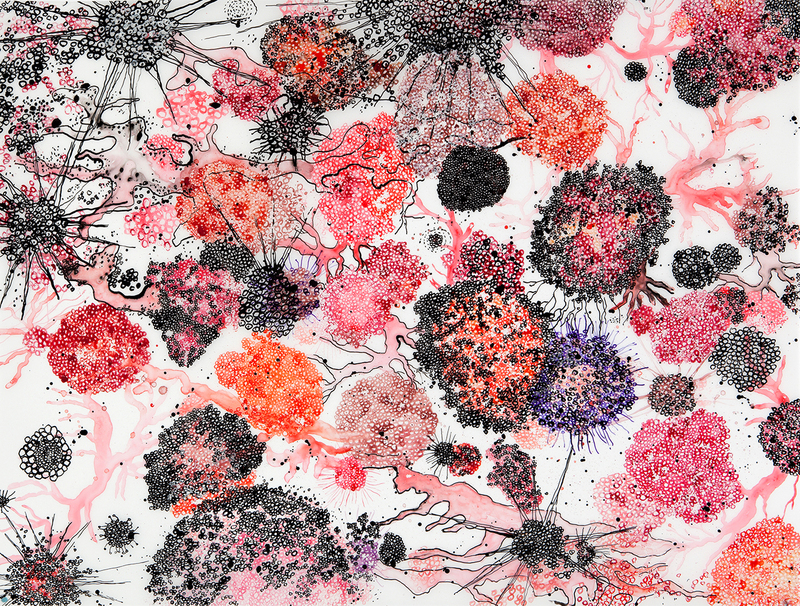 In an impressionistic manner, Dana Velan’s drawings covey a host of meta languages, acknowledging them as images. 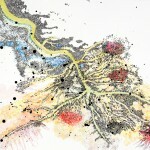 Her maps present incomplete images of certain mapping metaphors. 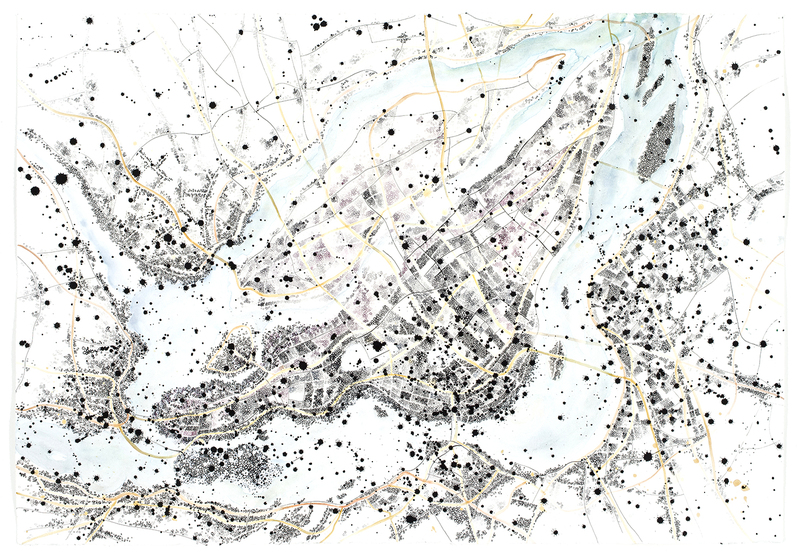 Proposing meditations on the gestures of mapping, they revel in its incompletion. That 1:1, snap perfect moment of escape, where we melt into space, continues to elude us. Each drawing, with its still, implied motion, opens up a fictitious horizon, a place for the passing of images, a knot of lines and signs, the trappings of a living light. These images will not be reduced to a uniform horizon. Here are the fleeting remnants of the legend, the broken ciphers of being. Reading without a definite territory or coordinate system to fall back upon. An admixture of signs, blooming into a bouquet of images. 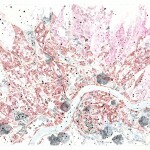 Colourful clusters and aggregates of data. Images of that which is only language. Recursive stories of efflorescence and collapse. Fleeting reminders of Darwin’s descriptions of the flowering and devouring of forms. Stems, buds and shoots of unknown genus. Alien anemones afloat. Fireworks and bouquets. Nameless flowers blooming in n-space. Our bodies botanic. 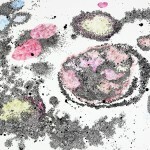 Replication and metastasis. Colours and disease. Malady awakening the thought of our bodies. 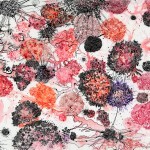 Spread of epidemics across a landscape. Dream or disaster recalling us to faraway cities. Patterns of settlement. Places we could go to. Wartime. Pattern bombing. What undoes the movement of life recalls us to it. Lifelines and thoughtstreams. Geographies of veins and arteries. The night electric of thought. The firing of neutrons in private skies. Webs of dendrites and axons. Birth of stars at the outer reaches. Cosmic drift. Milk heaven. The first and last breath of being in the folds of time. 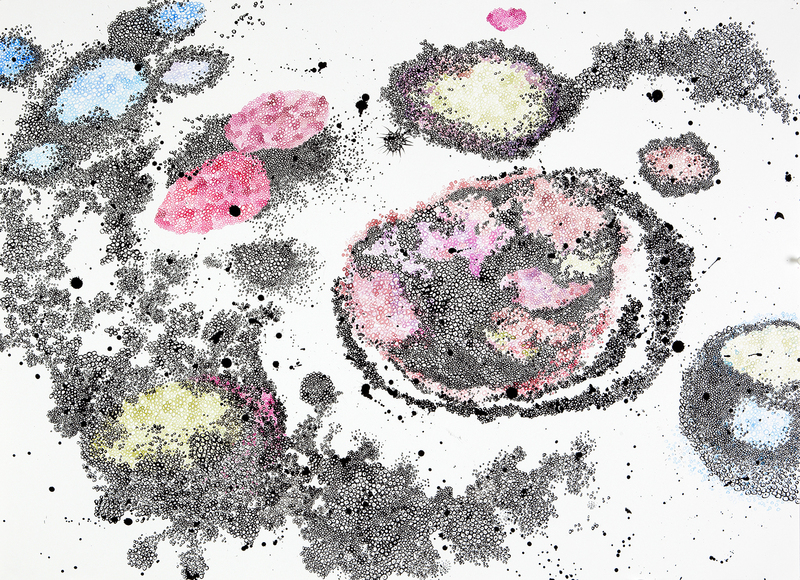 What these drawings depict are not lights, but distant, intimate objects, sending their radiant signals towards us. Knowing the exact nature of the connections could nullify the beauty of the latticework. Being, when it turns back upon itself, does not have to be a stranger to its own form. So what if we are the sum total of a series of unconscious processes? Each of us adds to the number of unknowns. 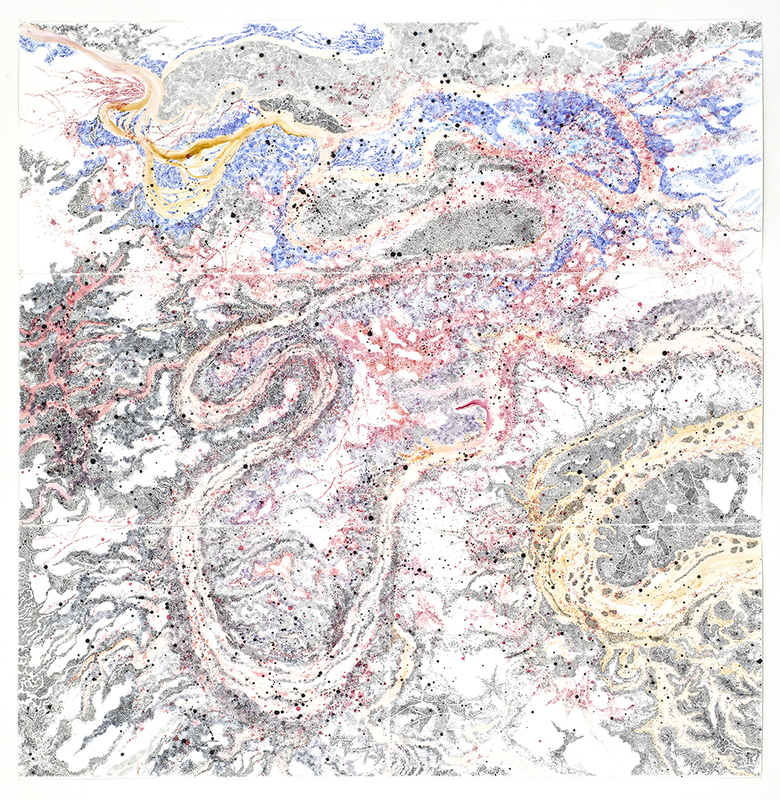 Dana Velan’s maps teeter on the edge of our personal spacetime. They are pictures from life. Level to our gaze. Gesture has quickened them. And here we stand, in intimate motion, suspended above or before them, between what we are and what we know to be. Her maps remind us that we are what we do not seem to be: that we are not only ourselves, but products of a mysterious, inventorless engineering, reaching infinitely far inside and outside us. That we are of that place where we make our lives, of the world which is world, despite us. 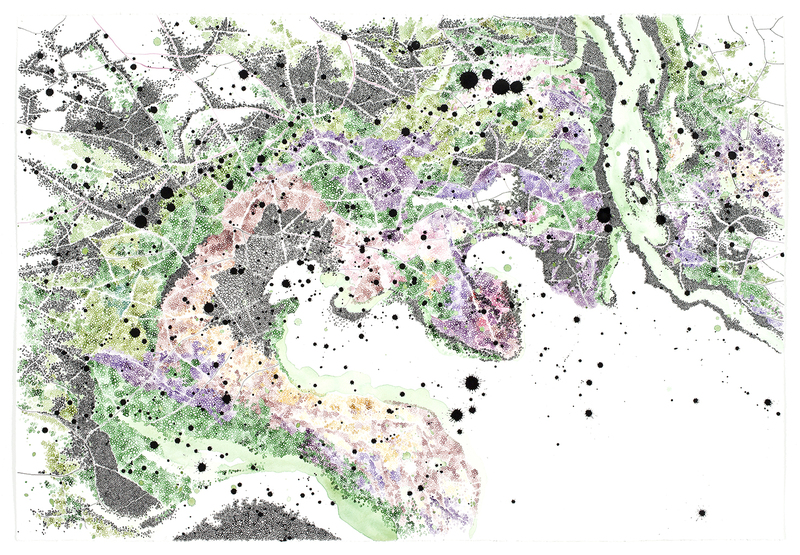 Dana Velan’s maps deny us the comfort of scale and legend, and although familiar seeming shapes cross through their expense, they escape exact definition. Some are close, some are far, none are quite what they seem to be. 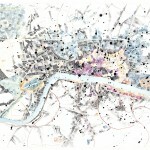 Mapping, we know is always an incomplete gesture, denied the fullness of space. Before her maps, we find again the key to implicit motion, and are left, legendless, to our own devices. Whatever these drawings depict, they reassert that We are here.